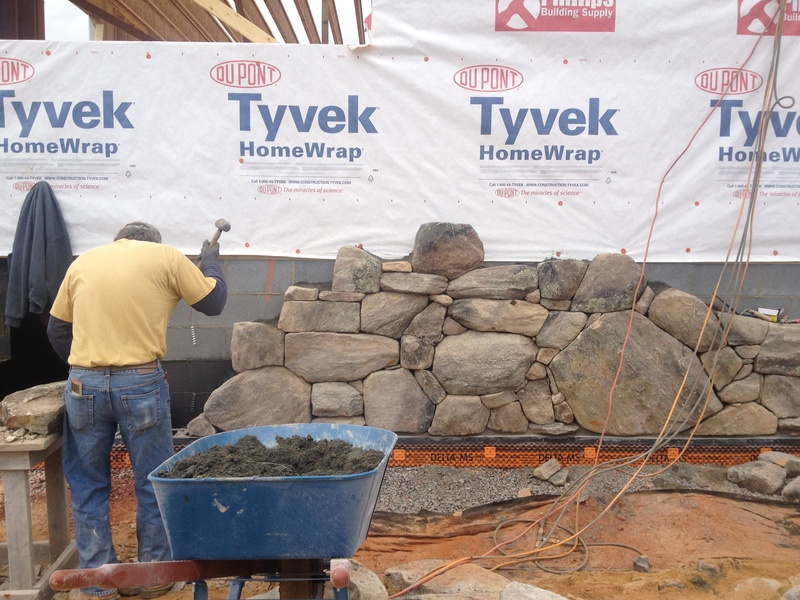 Ron Williams is working on a custom stone foundation in Winston-Salem, which isn’t something every contractor can do in this area. Harvesting the stone is a special craft. When it comes to building your dream home, it’s the little things that make a difference between liking your home and loving it. At Ron Williams Buildings, we treat each project like it was our own, making sure to get every detail just like you want. One of our recent projects is a perfect example of how we take time to get the details right on your home. The homeowner wanted a foundation built out of stone, and not just any stone. He had a special request for stone from Sauratown Mountain. We knew that no one was extracting that stone from there, but that didn’t stop us. Ron and his stonemason took a trip to Sauratown Mountain to look for just the right stone. Once the stonemason picked out what he wanted, a crew was sent to start the extraction. Now the stonemason is working on this custom stone foundation in Winston-Salem with the specific stone the homeowner wanted. Each rock is carefully chosen for its color and size. In the end, it will be not just a sturdy foundation for a home, but a true work of art. This is just one example of the dedication you get when you choose to do a project with Ron Williams Builders. Whether you’re looking at adding a deck, remodeling a kitchen or building a home from the ground up, we take the time to get to know you and your project, so the end result is exactly what you’re looking for. To see more of our work, check out our Photo Gallery, or give Ron a call at (336) 924-5675 for a free consultation.